The White Widow marijuana strain is considered to be the mother of all cannabis strains by many, and it is one of the best strains available today. That's why it desurves a page of it's own. This classic strain has become Legandary for it's extreme potency, it's typical white snowy buds and has been one of the top-shelf strains in the Amsterdam Coffee shop scene for several decades. Being a crossing between sativa and indica (60% Indica/40% Sativa) it was one of the first and perhaps the most famous strain that brings the best of both world's together: The sativa quality enhances the smokers mood and gives a powerful burst of euphoria and energy, the mix with typical Indica qualities like relaxation and stress relief makes this a perfect strain for social smoking. This legendary strain was developed in the Netherlands in the late 1980's by a breeder known as "Ingemar" who crossed a sativa landrace from Brazil mother with the name of Manga Rosa and a South Indian Keralan hybrid. Arjen, the founder of Greenhouse Seeds who are still selling the original White Widow strain bought this strain from Ingemar in 1985. There is a lot of speculation going around on the internet about who "invented" White Widow. Truth is that it Ingemar created this strain long before the alleged inventor "Shanti Baba" arrived in Holland under the name of "Arnhem's Wonder". Arnhem's Wonder won the first High Life cup in 1989. Arnhem's Wonder was then rebranded to "White Widow" and sold to Greenhouse Seeds who won the Cannabis Cup for the first time in 1995 under that name. After that this popular strain won many other rewards. While being an incredibly uplifting and creative smoke, White Widow is also legandary for it's Medical qualities. It has become a popular strain for many medical marijuana patients who suffer from stress, depression or pain and is often perscribed to patients with Arthritis, Migraines, ADHD and Anxiety. Like most Indica strains, White Widow is a great appetite enhancer. White widow is one of the strongest Marijuana strains in the world. It is a compact plant of medium height. The buds only develop a few amber-colored hairs and has snowy looking, large thick buds which are covered in white trichomes. 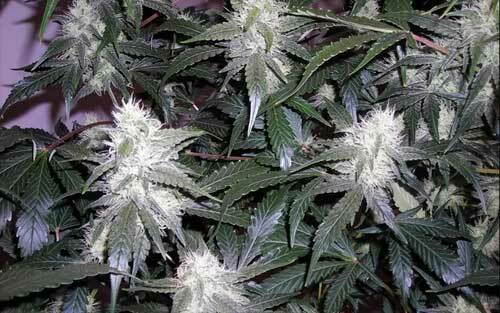 White Widow is easy cultivate, and has a high resistency against mold. Please note, the characteristics below are average characteristics. Since this strain became available in the early 1990's many seedbanks have created their own varieties, characteristics vary per seedbank. Effect: Well Balanced - Extremely Pleasurable High. Relaxing and uplifting. White Widow is one of the best hybrid strains we know and is a perfect strain for social smoking. Every Self respecting Seedbank has it's own White Widow strain in their product range.